‘Tis the season. For a pizza party. 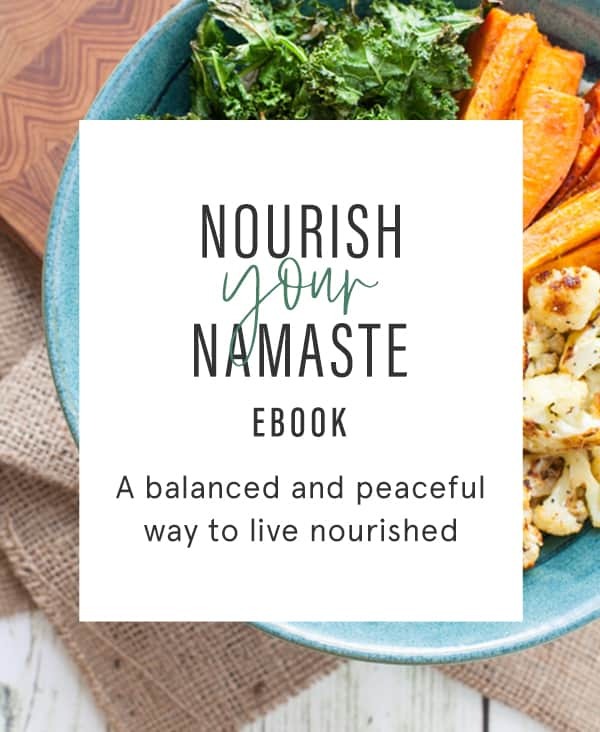 The countdown for Super Bowl Sunday has begun and surely we all need some delicious and nutritious pizza recipes on hand to keep our guests fueled to cheer for their favorite team. 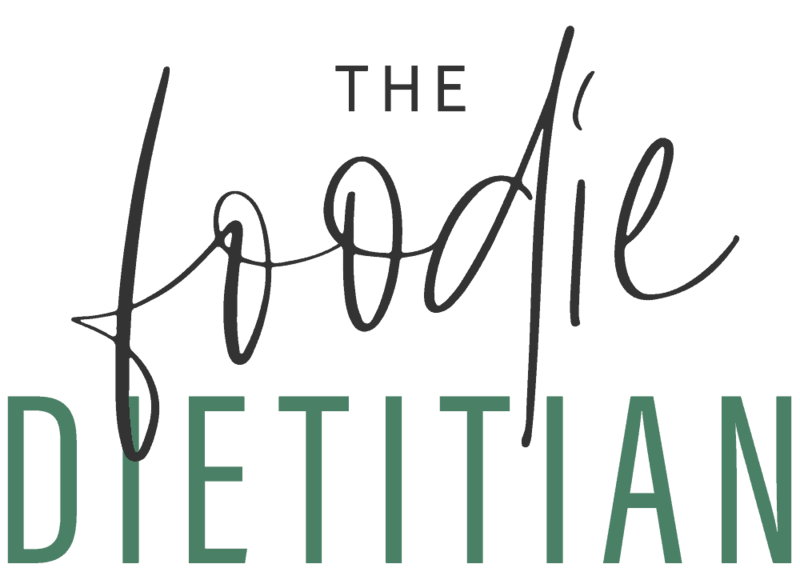 This month’s recipe redux is all about the healthy pizza party. Pizza can have a bad rep and I get why. Traditionally, they’re loaded with tons of cheese and meat and have super thick crust made with white flour. But, who says that’s how we have to make them? Pizza can actually be a healthy choice depending on the dough and toppings we choose. For more tips on how to cut calories from your ‘za, check out my post on Pizza Made Healthy. So what toppings did I choose, you ask? Well, I just can’t get enough of Brussels sprouts in the winter time. 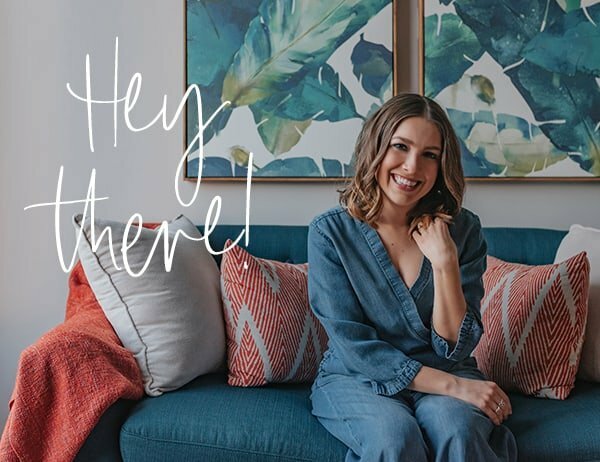 They’re loaded with vitamin C, which comes in extra handy during these months when the common-cold is making its rounds. Seriously, throw them on anything and I’ll eat ’em. Heck, why not throw these lil’ green guys on a pizza pie? For the crust, I went whole-wheat style and threw some flaxseed in there too. Flaxseed is a great source of fiber and omega-3s. Combine all ingredients except flax in a large bowl either by hand or using a mixer. Add the flax and knead mixture together until no longer sticky. Cover and let rise for 1 hour. Cut dough in half and separate to rise for another hour. While rising, preheat oven to 450 degrees. Roll the dough out onto a pizza stone until 14” in diameter. Bake on the lower rack for about 10 minutes, until the edges start to slightly brown. Remove from oven and arrange toppings. Repeat for second pizza. On a baking sheet, toast the walnuts for approximately 8 minutes, until they begin to brown. 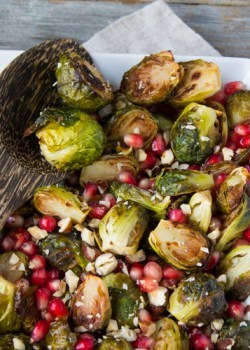 In a medium to large roasting pan, toss together the olive oil, brussels sprouts and shallot. Season with salt & pepper. Turn the oven up to 375 degrees and roast for 50 minutes, until brussels sprouts are tender inside and crisp on the outside. 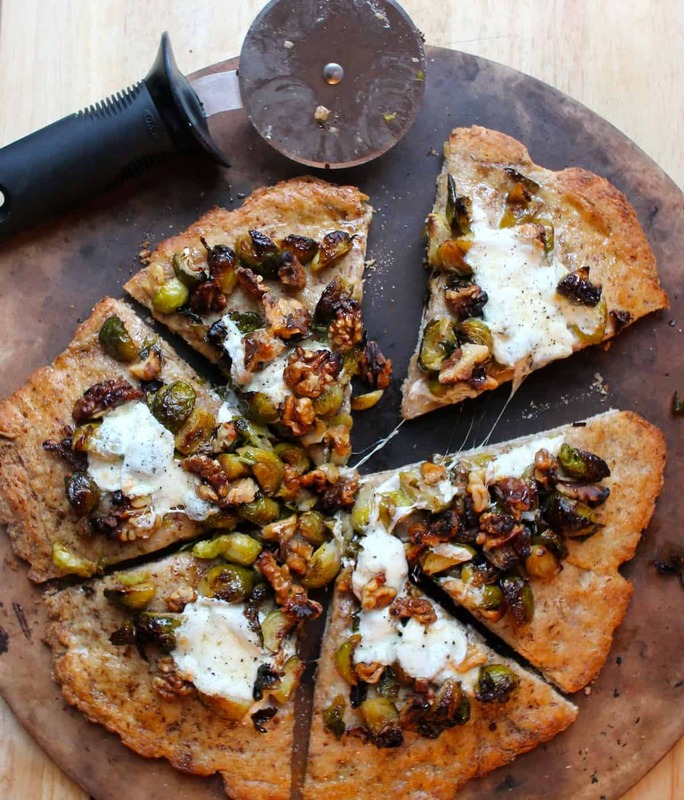 Brush 1/2 tbsp garlic olive oil all over dough and add half of the brussels sprouts, walnuts and burrata (save the rest for second pizza). Bake for another 8 minutes or until cheese is melted and crust is slightly brown. Remove from the oven and season with salt and pepper to taste. Drizzle honey over pizza and serve. Repeat for second pizza. 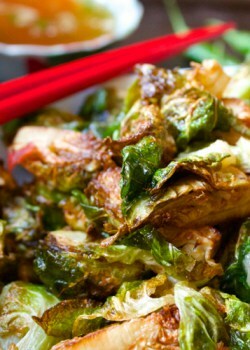 Those brussel sprouts look perfectly cooked and caramelized! 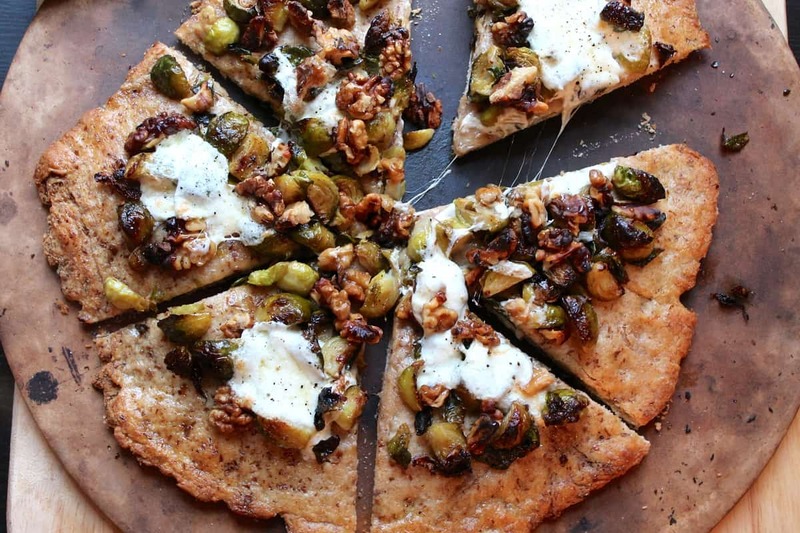 I had a brussel sprout pizza once and it was amazing. Love the whole wheat flax crust, I can’t wait to make this at home! What an interesting combo- you have GOT to feel great after eating this pizza! Well done! Thanks! Yes, I drifted off to pizza bliss for a while after eating this. Looks delicious!!! 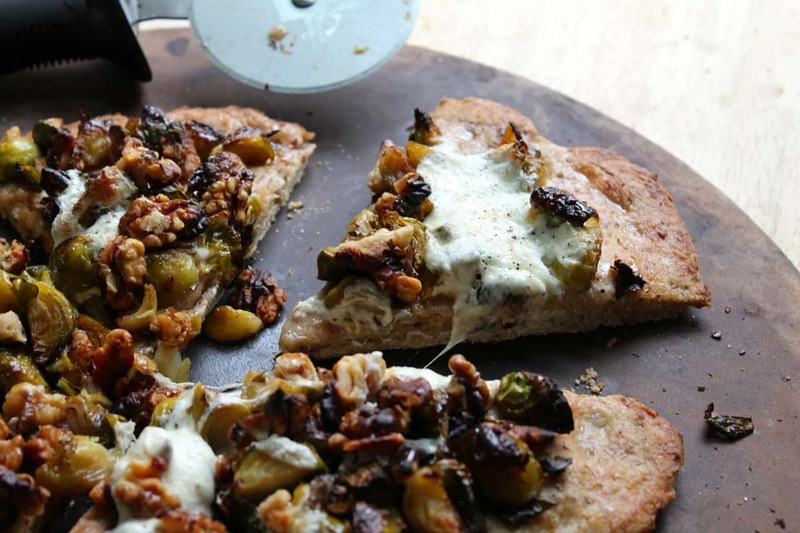 Love the idea brussel sprouts on pizza! Thanks, Alex! I can’t get enough of Brussels this time of year. I added brussels sprouts to my pizza too! 🙂 Love getting veggies in this way. Great minds, Debbie! I loved your pizza combo too – I have got to try that cauliflower crust. This looks amazing! I wonder if I could create a gf pizza crust that would work as well as your whole wheat. Yum! Thanks, Jill! I’m sure you could – I’ve seen plenty of recipes out there for gluten-free flax crust. Let me know how it turns out! Agreed. Burrata = a creamy piece of heaven. When do you add the flax to the pizza dough? Great catch, Jo-Ann! How could I forget the most important ingredient? Right before you start to knead the mixture. Post is now edited to reflect that. Thanks Kara. Going to try this over the weekend! Sounds yummy!